Hercules above the star Vega. Today’s closer view can help you identify the most famous deep-sky object within this constellation. It is a globular star cluster known as M13. Today’s chart shows the location of M13. 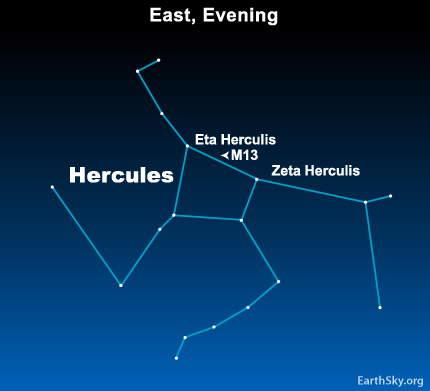 It is about a third of the distance along a line between the stars Eta and Zeta Hercules. We are not showing you what the cluster looks like on this chart – and in the sky, you’ll see it differently, depending on what instrument you’re using. To the eye alone, M13 is barely visible. You would need the darkest possible sky – and the best possible conditions – even to glimpse it. However, binoculars will pick up the cluster as a hazy spot of light. A telescope would reveal a glorious cluster of stars – symmetrical in shape – with stars more closely packed at its center. Globular star clusters such as M13 are thought to be our galaxy’s most ancient inhabitants. Billions of years before our sun formed, the stars of M13 were burning brightly! Site contents copyright © 2019 Recorder Online	except as noted. All rights reserved. | 88 queries in 2.241 seconds.